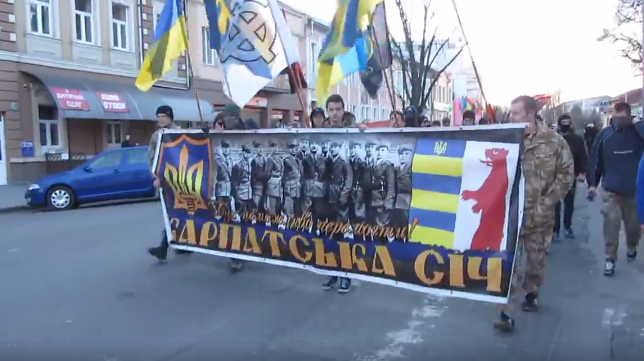 Ukraine, Uzhorod – On Sunday the 13th of March, a demonstration of Ukrainian paramilitary nationalists had been held in the streets of Uzhorod, in western Ukraine, near the Hungarian border. 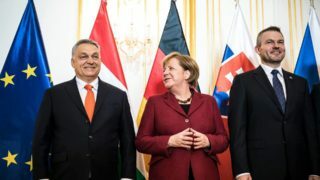 Anti-Hungarian slogans were shouted, and Hungarian politicians reacted. 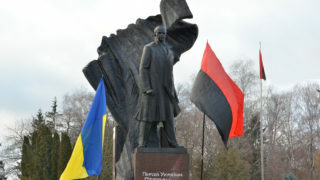 On the 13th of March, in the capital city of Transcarpatian oblast (region), approximately 300 people took part in a demonstration to commemorate the independent state of Carpatho-Ukraine, which had been declared by Avgustyn Voloshyn on March the 14th and ended the same year on the night of March the 15th to March the 16th, due to the Hungarian invasion. The demonstrators were mainly from the Carpathian Sich, Right Sector, and some paramilitary troops in uniforms of Azov and Aidar regiments, which are currently fighting units in Donbass, Eastern Ukraine. During the demonstration, slogans such as “knives for Hungarians!” were shouted by the crowd, in the center of Uzhorod. 7% of the city’s population is still Hungarian. The oblast of Zakarpattia is the westerner part of Ukraine, and still inhabited with more than 150,000 Hungarians, which are the first minority in this oblast, accounting for 12,1% of its population. Fidesz-KDNP ruling coalition’s MEP Andrea Bocskor reacted to this provocative event by asking the Ukrainian authorities to react strongly toward the perpetrators of hate speech and calls to murder. She added, that such extremist events reflects negatively on European Union’s judgement toward Ukraine and hinder the process of democratization of the country. Jobbik MP and party’s vice-president István Szávay made a statement in which he said how shameful it is that Ukraine, which wants to integrate the European Union, is still letting such events to happen, without consequences for the ones threatening local minorities. He added, that Jobbik waits for more pushing actions of the Hungarian diplomacy toward the Ukrainian government, in order to help and protect the Hungarian minority of Ukraine. Zakarpattia oblast was part of the Hungarian Kingdom from 895 to 1920, until the treaty of Trianon gave the region to the new country of Czechoslovakia. The region had back then a strongly heterogeneous population, with 56% Rusyns, 30% Hungarian, 10% German. In 1939, Hungary took back the whole region. In 1945, the region became a part of the Ukrainian Soviet Socialist Republic, which was itself part of the USSR. After the fall of the communist regime, the region voted for the autonomy in 1991, but it has never been granted by the Ukrainian authorities.